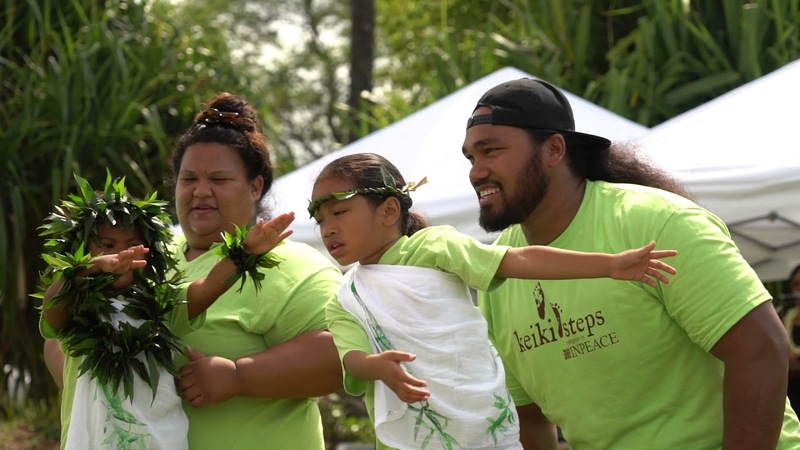 Keiki Steps Oʻahu was proud to present its second annual Hōʻike. The location was perfect: in Kapolei at the hula mound, at the base of Puʻuokapolei, Keiki Steps chose to honor the significance of place. The theme this year was Kuʻu Wahi Pana (My Beloved Wahi Pana). Wahi pana are legendary places in our islands. Each Keiki Steps site learned about the traditional land boundaries, mountains, wind and rains of their specific site. They then chose a song specific to their wahi pana. Our Keiki Steps Director provided site teams with a haʻiʻōlelo hoʻolauna (introduction speech) outline. Each site team then created an introduction speech in Hawaiian that they delivered before their performance at Hōʻike. Parents, students and staff represented their Keiki Steps site with their respective haʻiʻōlelo hoʻolauna. Leihōkū collaborated with the 5th and 6th graders of the Polynesian Club who spent a few weeks teaching our Keiki Steps students and families their song, ʻO Sweet Pua Nani o Kaʻala. They joined our Leihōkū ʻohana and performed alongside our keiki. Keiki Steps also welcomed a great-grandmother who took the stage with Aunty Lei Watson from Nānāikapono to sing Nānākuli ʻEa. Aunty Lei also helped another Keiki Steps site coordinator to write her own mele about her ahupuaʻa, Māʻili. The site then danced to Aunty Lei’s very own word and song. INPEACE was proud to have staff from Kalaeloa, Nānāikapono, Ka Pua, Leihōkū, Waiʻanae, and Kamaile sites who joined the Keiki Steps leadership team to dance a hula in honor of Kaiona, goddess of Kaʻala. Our parent volunteers, families and staff all came together to share our hearts and create the Hōʻike, a beautiful opportunity to honor our island home and our ʻohana through mele and hula.